Um, so for once, I don’t have much to say. How grateful some of you must feel right now. I’m going to shut up for once and let the food do the chit-chatting. 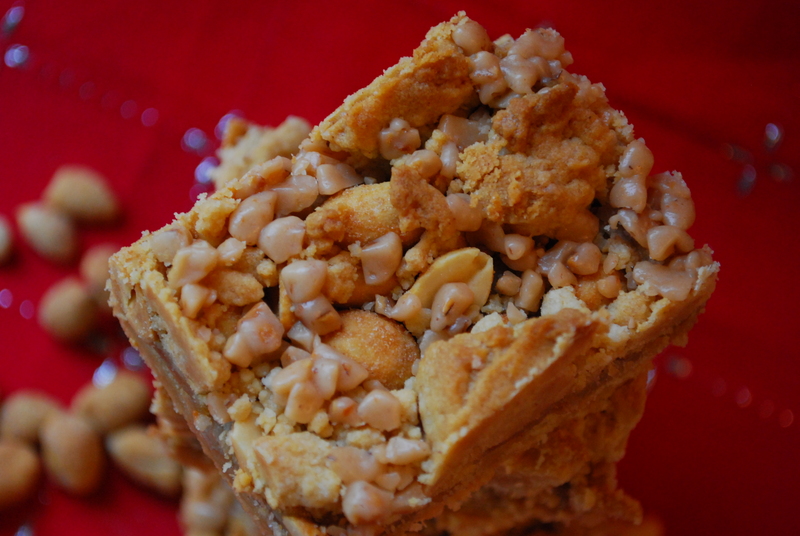 These Peanut Brittle Bars have a lot to say. I mean, wouldn’t you? 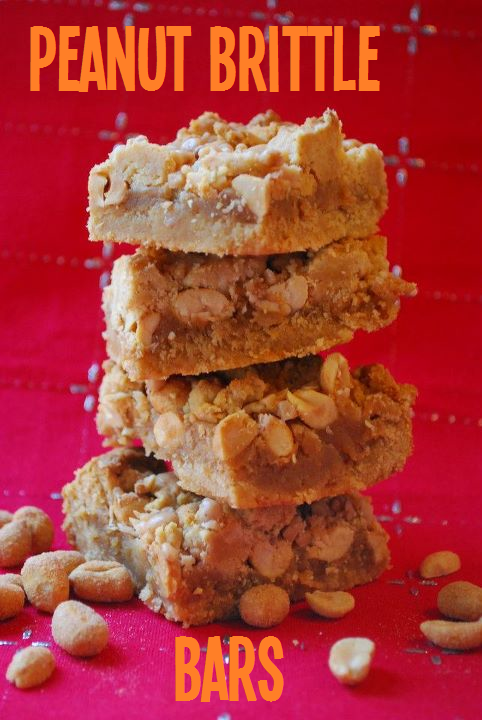 Especially if you’ve got a peanut butter base, a toffee-peanut butter center and a crumbly peanut butter top? Can I say ‘peanut butter’ any more in one sentence? Yup. Peanutbutter, peanutbutter, peanutbutter. Said it. Now I’ll say no more. This is depressing. I hate being quiet. That, and for fending off attackers, which I’ve yet to run into. They’ll be in for it. 1. Preheat your oven to 350 degrees F. Lightly grease a 13×9″ baking pan with cooking spray and set it aside. 2. Meanwhile, mix the cake mix, ONE cup of the PB, the egg and oil in a large bowl and beat it together with a mixer until it’s blended and crumbly. Take out about 1 cup of the dough and set it aside. Press the remaining dough into the prepared pan (I used my heavily greased up hands, but a greased up rubber spatula would work too) and bake off for 10 mins. 3. While the crust is baking, prepare your filling: whisk together the condensed milk, remaining 1/3 cup of peanut butter and the vanilla in a medium bowl until smooth and blended. Pour filling onto the par-baked crust and smooth it into an even layer. Sprinkle the filling with the dry roasted peanuts. 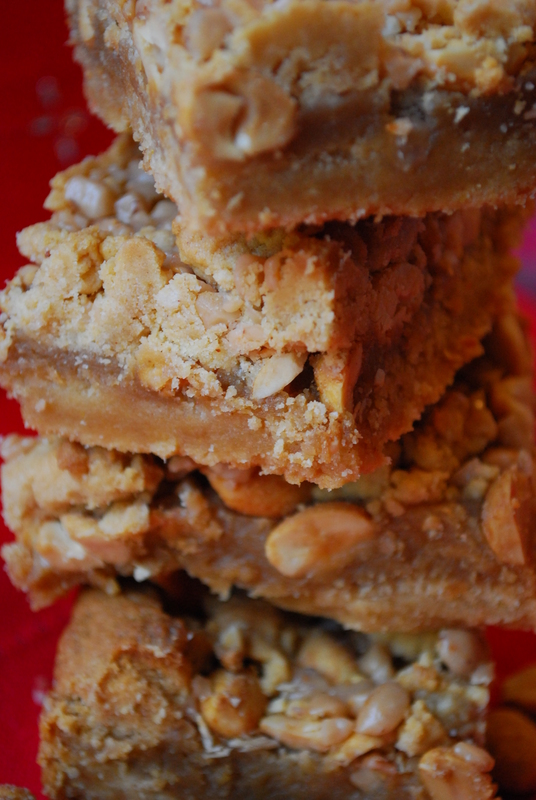 Using your fingers, crumble the reserved dough on top, then sprinkle with the toffee bits. 4. Bake for about 20-25 minutes or until the center is firm and set and bars are lightly golden brown. Cool on a wire rack completely, then cut into bars. Store airtight. I’m just gonna leave you with this–you must try these. You know me & peanut butter… we have that love/hate thing going on per usual. But I really loved these bars because peanut brittle’s my faaave. We go way back. Those look great! Sweetened condensed milk and cake mix? Yes please! Is it wrong that I kind of want to crawl into a can of sweetened condensed milk? It looks so warm and cozy and goopy.